Hitachi Solutions delivers this solution to provide holistic monitoring of their organization and to help Retail Banking customers gain meaningful insights into their business that drive actionable results. With a large number of customers carrying out a multitude of different transactions on a daily basis, banks need help understanding business performance, analyzing their pipeline and growth, and keeping an eye on profitability. Success requires continuous tracking of the business as a whole and also the ability to view detailed performance information of individual products and lines of business. Hitachi Solutions has developed a solution that connects directly to cloud CRM data sources, serving up key business performance information using intuitive visualizations. This provides the ability to quickly identify which elements of the business are performing well and which require timely attention. Analyzing customer profitability through a comprehensive perspective, assessing the profitability of industry, customer segments, loan types, and geography. Visibility into the performance of different revenue channels and the close monitoring the revenue generation of different customer divisions and territories. Leveraging historical data to provide insights to the year-over-year or month-over-month growth of different bank divisions; allowing strategic decisions to be made about which divisions require support and which are showing healthy growth. 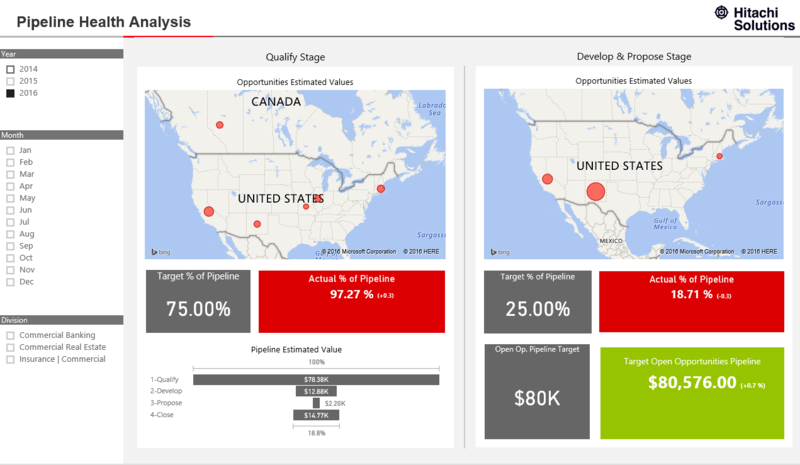 Monitoring pipeline health by setting strategic KPI targets for the sales pipeline, and tracking the current pipeline against these targets. The ability to drill from summary level dashboards, that capture the holistic view of the organization, into the opportunity level details; thus supporting the capability to do key investigations on the data and enabling sound decision-making. 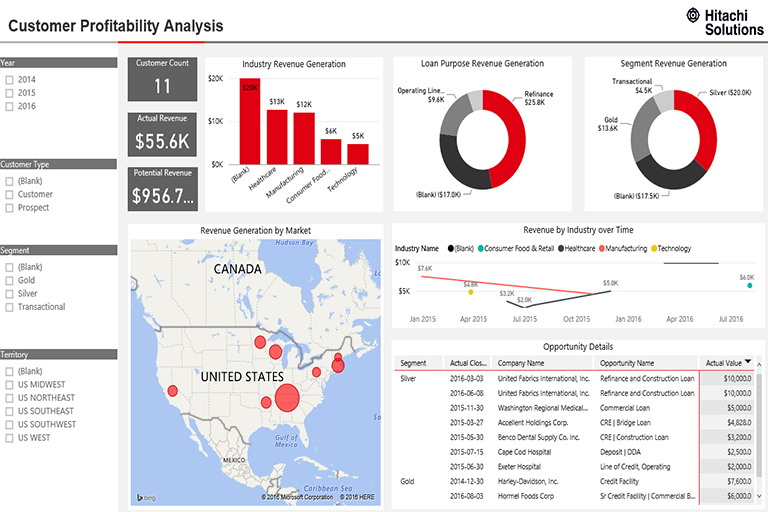 A live connection is with CRM online data, allowing these dashboards to continually update automatically. This ensures that the information displayed on these dashboards always provide the most current view of the business and how it responds to the strategic decisions of the company’s leadership. Hitachi Solutions’ Retail Banking Dashboards simultaneously provide both a big picture, as well as a detailed view of the performance of a bank’s products. 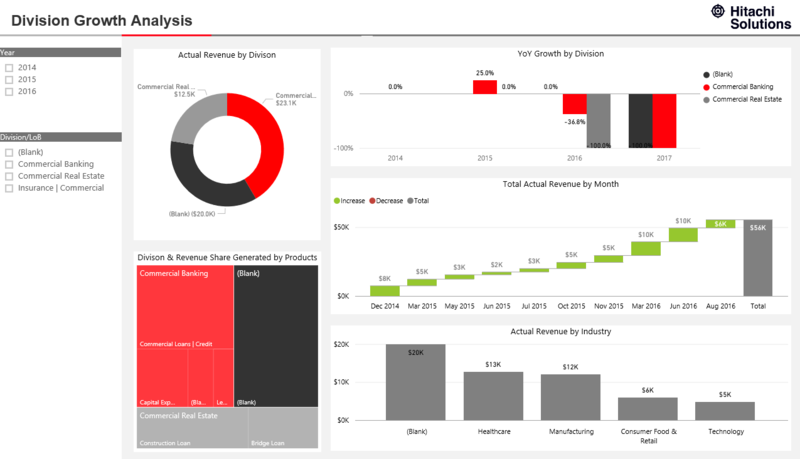 The dashboards give different perspectives of the data, providing the ability to carry out analysis across customer groupings, product groupings, and pipeline stages. This provides management and the leadership teams with the right information they need to be effective decision makers, in a timely and intuitive format. The optimal way to utilize these dashboards is to connect them directly into your company’s CRM system. This will allow your organisation to be empowered to make the right decision at the right time, to monitor the results as they unfold and to adjust as needed.